In honour of everyone’s current obsession, we’re taking the favourite tournament and flipping it on its head – lacrosse style! 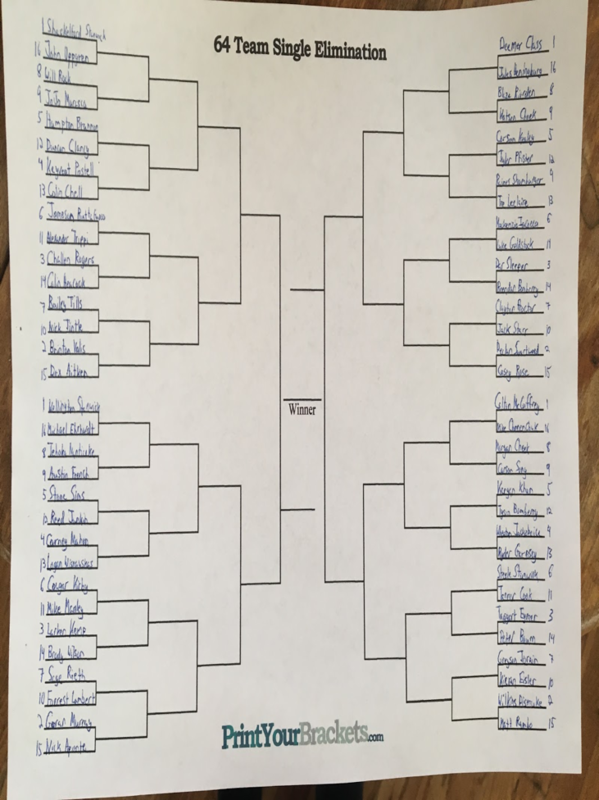 Welcome to – what is to my knowledge – the first-ever March Madness All-Name Bracket for field lacrosse! In determining each player’s seeding, I looked back at Inside Lacrosse’s past, and most recent all-name teams. If the player was selected to the first team they got three points, second team selections got two points, and third team selections one point. Players were seeded based on their point totals. The more points, the higher the seed. But that still left half the bracket to fill, so players were added based on how awesome I think their names are, and I hope you agree with my assessment. I used a randomizer to help determine their seeding. *Wells Stanwick was the only exception to this, because, come on. How can you have an all-name bracket and not have every single one of the Stanwick’s on it? I don’t think this first round matchup is really that close. John Uppgren has an electric last name but that is nothing compared to the #1 overall seed in the Hopkins senior attackmen Shackleford Stanwick, better known as Shack. This first matchup is too easy for Shackleford Stanwick as he easily moves on. Hampton Brannon that is just a total prep school kid name and I love it. He goes up against Florida Launch defensemen Duncan Clancy. This is a tough matchup because I do really love both names a lot. Hampton is a freshman at UMass and has seen a lot of playing time between the pipes and he has an assist this season as a goalie. With that kept in mind, I’m moving Brannon on. 13 Colin Chell, Ohio St. This an easy one for me I’m not the biggest fan of the name Keyveat Postell no offense to his parents who gave him this name. I love the name Colin Chell, and I also really like NHL, or as some people may call it…Chell. So with that in mind, I’m moving him on. Winner: 13 Colin Chell, Ohio St.
Jameson Buttafuoco is a very interesting name and I like it a lot but going up against the trip master Alexander Trippi it’s tough. I love the last name Trippi and he is also an amazing player and I have known about Trippi for a long time because of his crazy highlight tape. Challen Rogers vs Colin Heacock this is a really hard matchup. I love both names and with that in mind, I’m making my choice on MLL stats. Rogers didn’t play a single game in the MLL last season while rookie Colin Heacock came out and became a big player for the Bayhawks right away. Rogers has played in 10 games and had five goals and one assist. In Heacock’s rookie season he played just eight games and he had seven goals and four assists. And looking at the numbers it’s easy to see who I am going to pick to advance. This is the first matchup where two teammates will go up against each other. This is a tough matchup because I love both names. Tintle is a gritty defensive midfielder while Tills is an attackman/midfielder who will come out of the box to give the Outlaws offense. But Tills played in just one game this past season while Tintle played in nine games. With that kept in mind, that’s not gonna stop me from making my choice as a person named Bailey – us Bailey’s have to stay together so I am moving Tills on for now. Brinton Valis and Dox Aitken. This an interesting matchup. I really do like both names, and I have to look at their play on the field to make this choice. Valis came into his college career as the #7 player in the country in the class of 2014. Valis has just 13 goals and three assists in his time at Hopkins. Aitken just this year has 19 goals and 10 assists good for 29 points. Just this season Aitken has more points, goals, and assists then Valis has had in his entire career. Wellington Stanwick or better known as Wells is just such a great name. As much as I love Michael Ehrhardt, his name doesn’t come close to beating Wellington. Try saying Tehoka Nanticoke five times fast… Yeah it’s hard and with that in mind it’s a great name and he moves on because of it. Stone Sims and Reed Junkin those are two amazing names. I’ve known about Junkin for a long time since he came into Penn and was immediately the team’s starting goalie. And that’s why I’m taking the upset in this one. Logan Wisnauskas is a great name but there is just that IT factor about the name Carney Mahon that makes me love it and is why he is moving on. It’s a Cougar vs Manley. But in this battle, the Cougar wins. Cougar Kirby moves on. You say the name Brody Wilson I would think this person is either a professional snowboarder or a kid that plays Ultimate Frisbee. And that’s why I love it. Sorry Larken, but I’m going surfing today. Run Forrest, run! Forrest moves on strictly because that is the first thing that comes to my mind when I see this name. Goran Murray in my mind is just such a better name than Nick Aponte. Aponte is a cool last name but come on Nick first name. I got lazy towards the end of picking some of these names no offense Nick! But Goran is moving on. DEEMER CLASS, yeah that’s his actual name. This is honestly a tough one Blaze Riorden vs Watson Cheek. Both are electric names but in the end, the Big Bad Blaze is rolling on. BOOM PFISTER. In my mind I just don’t get much out of the name Corson Kealey that’s why Pfister is moving on. 13 Tre Leclaire, Ohio St.
Tre Leclaire is a great lacrosse player and has a great name. But he is just running into a buzzsaw on Raines Shamburger. That’s a one of a kind name you can’t beat that. Goldstock is just a pure golden last name. I love it, and an easy reason why he is moving on. When I first looked at this matchup I thought Brendan Bomberry and then I thought wait a second I’m sleeping on Dar Sleeper, and with that Sleeper is moving on. Not a big fan of the name Clayton Proctor but Jack Starr is an amazing name. And the fact Starr is spelled with two R’s is even better. Declan vs Casey that’s a tough first name matchup, but I feel like I know more Casey’s than I do Declan’s. And the last name Swartwood is electric, and he is moving on. If a 16 was going to beat a one seed it was gonna be in this matchup. But looking at again Colton is such a better name than Mike. But the last name edge goes to Chanenchuk but the fact Mike is such a common last name that’s why I got McCaffrey moving on. This may one of the best matchups in the first round. Morgan Cheek and Carson Song are two incredible names. Morgan’s younger brother and fellow teammate Watson Cheek fell to Blaze Riorden and this a tough pick but with the idea of revenge on Morgan’s mind, he gets to move on. Whoever wins this matchup will make a deep run. The Bomberry’s are both first-round exits. Keegan Khan is a great name and the freshman has been outstanding so far the Villanova Wildcats. These two teammates square off and this is an easy win for Wheaton Jackoboice. Ryder is a great name but that doesn’t beat Wheaton Jackoboice. Tanner Cook is a great name especially since Cook has been cooking for the Tar Heels this season. But Steele Stanwick is an amazing name, is there anyone else in the world with the first name Steele? And with that in mind, Steele and the Stanwick family are all moving onto the 2nd round in this bracket. Baum squad baby! In my opinion, Peter Baum was screwed out of the MLL MVP award last season, and he’s not getting bounced in the first round of this tournament. I’m taking Baum in the upset over Taggart Eymer. This is another tough matchup when I hear the name Kieran I think of Kieran McArdle, unfortunately, not Eisler. And Greyson Torian is a great name and the fact he is a Navy boy gets him moving on. Rambo won a national championship last year but he is a first-round exit in the name bracket as he goes up against Wilkins Dismuke, a tough name to beat. Thoughts? Challenges? Leave ’em below!